"Over 500 Flavors of Natural Lip Balm to Feed Your Addiction! & Other Bath & Body Products too. My Lip Stuff is Serious Skin Care with a Fun Flair! My Lip Stuff products are skin, earth, and animal friendly. That means we NEVER test our products on animals and use only the finest ingredients that are skin safe and environmentally friendly. 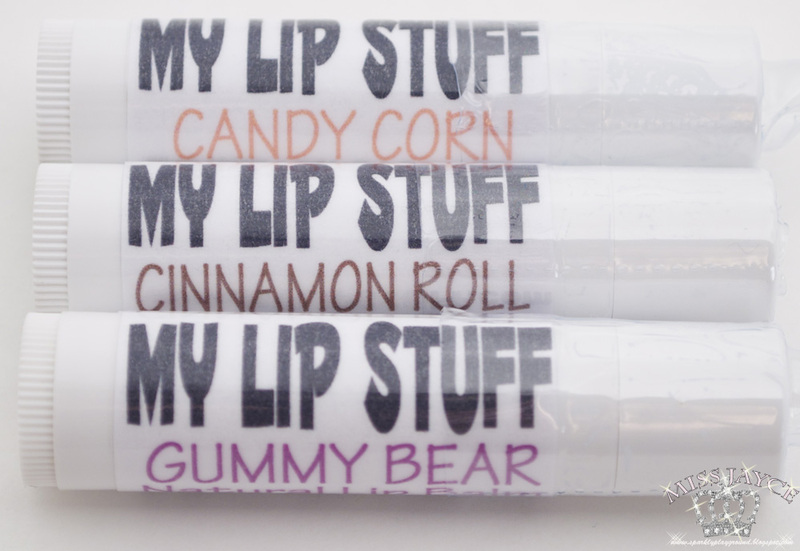 My Lip Stuff products can be customized or personalized for the ultimate lip balm experience. Custom label lip balms are great for business promotions, weddings, showers, or any event where you'd like to give a personalized gift. Check out our website for tons of information about our products or just go straight to the ONLINE STORE and go shopping!" The package I received and lip balms are packaged in plastic bags. 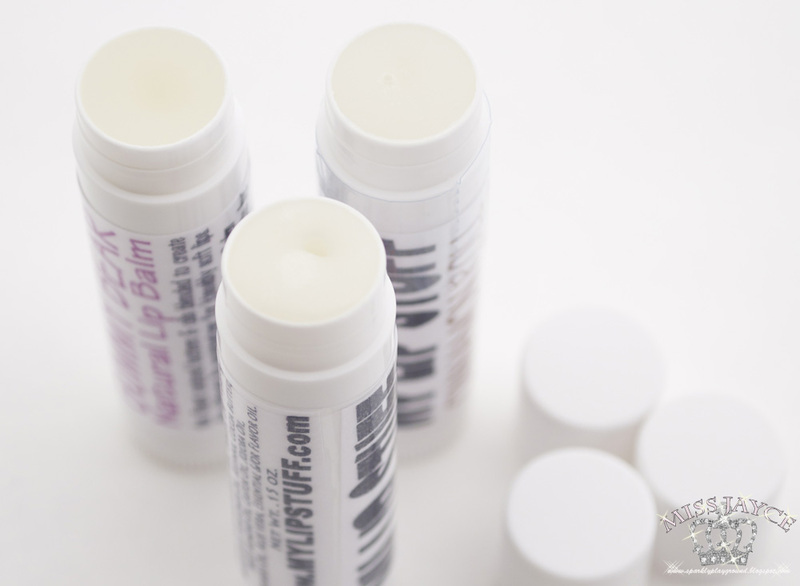 In this review post, I will be reviewing the sponsored lipbalms. Next post will be on the lipbalms I purchased. Here are the Lip Balms sponsored by the Company. The finest natural butters and oils blended to create the ultimate lip moisturizer for kissably soft lips. Candy Corn Lip Balm - Creamy butter and sugar, caramel, and a hint of vanilla make up our version of the popular candy! Stevia sweetened. Cinnamon Roll - Cake, Cinnamon, Creamy Vanilla and Stevia sweetener make up our version of the yummy ooey gooey cinnamon rolls you eat for breakfast! Stevia sweetened. Gummy Bear Lip Balm - Just like the little gummy candies. Fruity and sweet! Candy Corn Lip Balm - $2.50 USD for Net Wt. 0.15oz. Cinnamon Roll - $2.50 USD for Net Wt. 0.15oz. Gummy Bear Lip Balm - $2.50 USD for Net Wt. 0.15oz. Just in case you were wondering, there is no color or tint on these flavours. I've cut down a lot on buying make up and I turned into a lip balm freak lately. And since both my boyfriend and I have dry skin types, we cannot live without lip balms. Many lip balms on the market uses many chemicals that I've never even heard of so when I came across natural lip balms, I was ecstatic! I received 2 food flavours and 1 fruity flavour. Personally, I usually prefer fruity flavours because it makes me feel really refreshed. The food flavours are very very good, but they make me super hungry and crave for food HAHA! The fruity flavour is Gummy Bear Lip Balm, and it reminds me of Cherries. Love that!! Candy Corn Lip Balm initially reminds me of Candy Corn but then lately my boyfriend and I thinks that it smells just like cappuccino! I tend to grab this one a lot! Lastly, Cinnamon Roll is no doubt, just like the name suggests. I'm in a lot of shock that the flavours smells so identical to the name. I'm sure most of us agrees that sometimes we encounter lip balms that smells nothing like the suggested flavour and we get disappointed. The fun part about MyLipStuff.com is that they have over 400-500 flavours!! I saw some that were flavoured like cocktails, candy, chocolate, cakes and so much more! In terms of the actual product itself, the texture and consistency reminds me of the C. O. Bigelow Rose Salve. It is buttery, and soft just vaseline. It's great that its in a tube form because one of the reasons why I didn't enjoy Rose Salve was due to the packaging. Compared to the Blistex and EOS lip balms, MyLipStuff.com lip balms are very soft and not waxy at all. If you press your lips harshly into these lip balms, they will become mushy, but that's why its good that its in a tube! My lips are moisturized and soft, and there's no harsh aftertaste. I taste a bit of oil but knowing that it's all natural makes me feel more secured and assured. Look forward to my next review on MyLipStuff.com!! I cant wait to show you what I had purchased! Packaging: 5/5 ♥ Plain and practical! Price: 5/5 ♥ $2.50 USD without tax is pretty good. I will talk about the Shipping Rates in the next review!